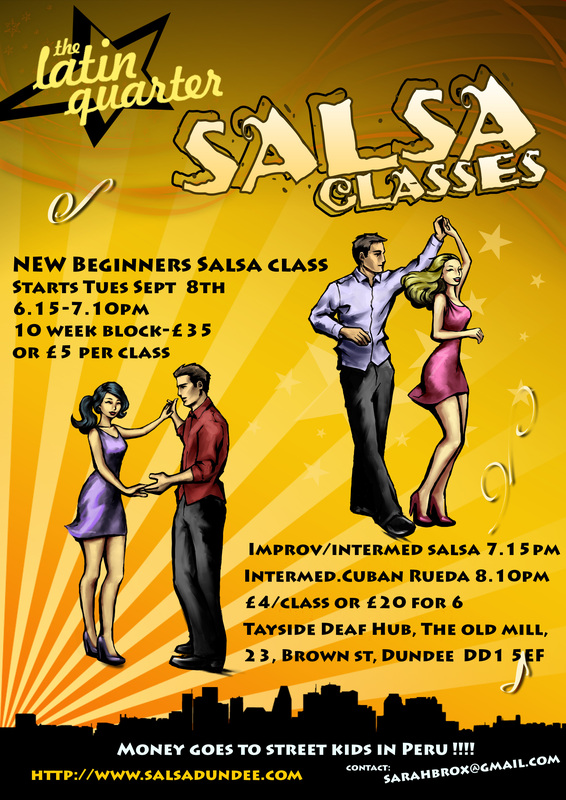 Tuesday 31st January is the last week to join the New Beginner Cuban Style Salsa classes at the Deaf Hub. See Class tab for directions. 9 week progressive class, £31.50 for the remaining 9 week pass or £5 a class (Students who are already competent in cross body salsa can join week 3 or 4, please email in advance). Class will involve partner dancing initially leading on to the Cuban Rueda ( wheel dance). No partner necessary, anyone welcome. Time 6.15- 7.10pm. Casual clothing is fine with shoes that stay on feet securely with a slippy sole preferably. There is NO car parking in the Old Mill car park as this is private, please park on Brown St. Email sarahbrox@gmail.com for more details. Please pass the word. Money raised for the Azul Wasi project in Peru for former street children. 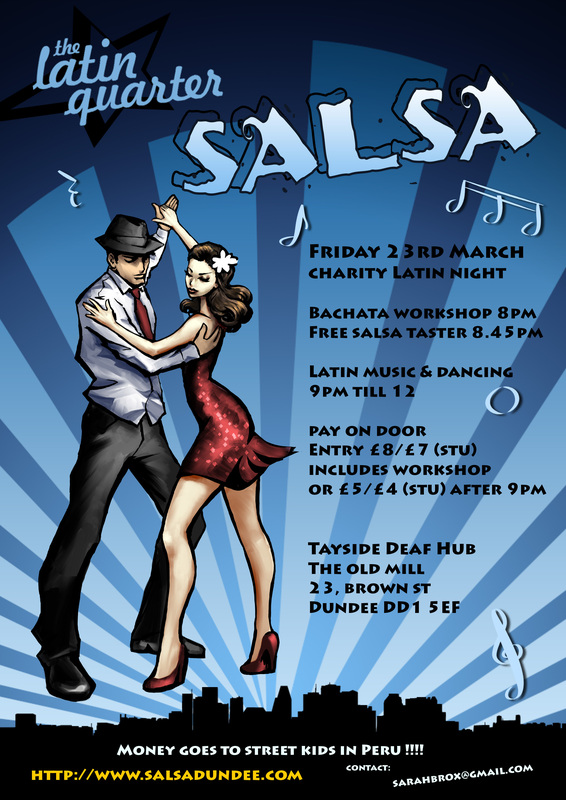 Latin Quarter latin social night – Friday 23rd March @ Tayside Deaf Hub,The Old Mill, 23, Brown St, Dundee DD1 5EF. If you are fairly new to Salsa or latin dancing come along to meet fellow salseros ! Anyone welcome. All money raised goes to the Azul Wasi project in Peru for former street children. Evening will start with a Bachata workshop – all levels, suitable for total beginners & also something for those with Bachata experience. Will also be a salsa taster class too for any newcomers. Pay on the door. £8/£7 (students) entry to LQ and workshop, or £5/£4 (stu) after 9pm, on till 12pm. Will be raffle on eve, donations welcome. Please pass the word & pop a poster up if you can.